Alan grew up on the small island of Martha’s Vineyard. Surrounded by water he quickly learned to swim, dive, sail and fish for fun and for work. 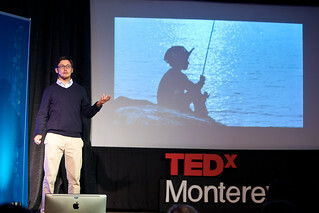 Stories of the wild and expansive Pacific brought Alan to Santa Cruz in 2000 to pursue an undergraduate degree at UCSC. After graduating, he headed south to teach sailing on the Sea of Cortez with the National Outdoor Leadership School. He returned a couple years later to study Marine Policy at the Monterey Institute of International Studies. Alan has spent time with The Nature Conservancy and Conservation International in Indonesia. Currently he is a Sea Grant Fellow with NOAA’s Northwest Fishery Science Center. He is a cofounder of Local Catch Monterey Bay, a community supported fishery that connects people with local fishermen for sustainable seafood. For Alan, the ocean sustains, inspires, and defines his way of life.